Five minutes start to finish. Plus an hour in the fridge. Sweet, squidgy and reasonably healthy. These met with the women's group stamp of approval! Melt butter, sugar and honey gently in a largish pan, when sugar is dissolved let it come up to boil for 2 mins. Stir in vanilla. Chop almonds into slivers. Stir in 3 cups of oats, the rice crispies and half the nuts and seeds. 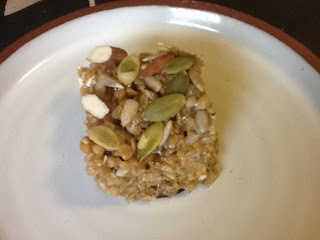 If it still seems too syrupy and sticky add more oats. Turn into a brownie tin lined with baking paper. Press down and sprinkle remaining nuts and seeds over. Chill in fridge for 1 hour then cut into 16 squares. We noticed that you have a lots of tasty recipes on your blog and would like to suggest you have a look at our Top Food Blogs section here: http://www.alldishes.co.uk/top-food-blogs.